Dress (as top): Joy, Skirt: Primark, Scarf: Primark, Belt: So old I have no idea! Ever buy something because its supposed to be fashionable, but then when you wear it, you just don’t know how to make it not look frumpy? I think I failed here. I bought the skirt in October or November last year but this is the first time I’ve actually worn it! The top is a dress that I did my usual trick of dropping bleach on it – total fail. 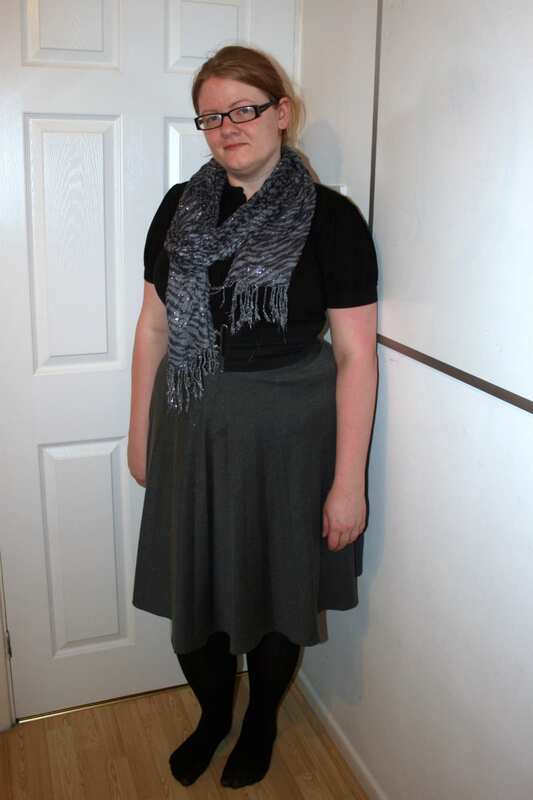 I’m still not sure about the skirt, but at least with these outfit posts I can see an outfit a bit better than in my wiggly mirrors from Ikea! Speaking of the insane spaniel who takes up more of the bed than the humans who are there – I’ve made a Posterous site so I can share the photos easily. That is all I will do. Otherwise that would make me a crazy dog lady. Another recipe I need to add to my ever growing list – Corn Dogs. I know, I know, they’re not exactly the best thing to eat, but I tried them in San Francisco and fell in lurrrrrrve. Meat on a stick, what else do you want? I love love love paper cut artwork (is there another name for it?) and these pieces by Sara Burgess are gorgeous. I wish I could make them myself! Animalswithstuffedanimals.com – thats all you need to know about the site really. Finally, because I’m going to sound like a broken record by next week – please do vote for me in the Freya Blog Star competition (if you saw my blog post earlier in the week, you’ll know my story) You just need to go to the Blog Star tab, and allow it to access your info, click my happy little face (!) Ã‚Â then click the “Vote for Me” bit. Easy peasy. I love that skirt, not to mention that mona lisa smile you’ve got gonig on! Is there some sort of ‘I would like more Veronica Mars please’ petition I can sign? Because a movie would be *amazing*! That cupcake vodka does sound amazing but because of my love of vodka not cupcakes..!